The charity is here to help you in so many ways – for grant aid on projects that improve the health and wellbeing of the people of Cornwall & the Isles of Scilly, to airing ‘hot topics’ about our NHS Healthcare delivery that are particularly relevant today as well as future events that we plan to run or our partners are planning- for the improvement of health and wellbeing for one and all. 60 years ago the last Cornish Chough disappeared from Cornwall (and the UK). They had successfully bred from 1947 but after a long decline and habitat loss they became extinct. 10 years later saw the arrival of the NHS –‘ a state welfare system that would be the envy of the world’ – Sir William Beveridge40 years ago a number of leading medical consultants at The Royal Hospital Treliske met to discuss the founding of a private hospital in Cornwall. The then government was planning to remove all private beds from NHS Hospitals. Separate accommodation was therefore required. Also increasingly health insurance was becoming part of an employee’s attractor as the bid for jobs in an improving economy was challenging. The NHS was struggling to keep pace with population growth and more tourists coming to Cornwall – thanks to epic TV programmes like Poldark. A private hospital was seen as the way of alleviating pressure, especially for straight-forward operations. Waiting list times for operations were steadily growing. By this time all major cities had private hospitals like the Nuffield centres who led the way, giving companies the ability to plan when their senior staff would be away for surgical procedures. However, the Provident Associations decided against a private hospital in Cornwall. This would result in reducing the attraction of good calibre consultants to Cornwall, a threat to consultants in post and the NHS in Cornwall as a whole. 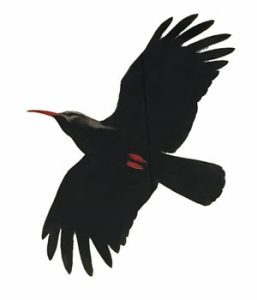 The original vision gained support, sponsorship and marketing materials were designed with the iconic Cornwall Chough as the symbol. Why? Because there was a strong desire to re-introduce Choughs onto the cliffs of West Penwith and the late Perranarworthal GP, Dr A.J. Coombes (artist and ornithologist – Oxford Book of British Birds) designed the graphic icon we see today.Seed-corn funding was donated by participating consultants allowing a favourable study to be undertaken and, under the chairmanship of Jim Beeching, (a local surveyor and former Mayor of Truro), aided by Major Magor, a number of other non-medical persons were subsequently gathered to seek donations from different areas of the County.Site approval was the made by Cornwall County Council on part of the Treliske campus. A sponsorship campaign was launched with a programme of fund raising events including everything from glamourous County Balls to ‘Bring & Buy’ sales and from private parties to auctions and raffles. By 1979 enough money had been raised through public subscription for the foundations to be laid for what we now know is The Duchy Hospital. With the general guidance of one consultant and the backing of a small group of other consultants, the project developed and Cornwall’s first private hospital was born. Her Majesty Queen Elizabeth, the Queen Mother, opened the hospital on Sunday 1 March 1981. Jim Beeching was Chairman and together with a board of Governors including the late Robert Robins, Ian Hamilton and current DHC member, John Cooper they managed the unit with all its new pressures arising from an entirely new venture. The Duchy Hospital flourished successfully for 9 years and the antipathy between it and RHCT faded when one found need to help the other and a natural partnership developed proving the worth of the original vision. But it became clear that a major modernisation programme was required to keep pace with technological advances in healthcare delivery, a demanding public and further pressure on Cornwall’s NHS. The decision was taken in 1990 to sell the hospital to a private management team for a sum in excess of £5m.Because the original funding had been brought in by the public’s generosity it was deemed appropriate to invest the money into a charitable body for the benefit of healthcare and wellbeing of Cornwall’s present and future generations. The Duchy Health Charity now, 26 years later, under the able Presidency of Michael Galsworthy CBE DL. The Charity is proud to have had, from inception, Royal Patronage; firstly the late Queen Mother and today HRH Prince Charles, The Duke of Cornwall who takes a keen interest in everything we do. Naturally the Cornwall Chough became the adopted symbol for the charity, recognising the continuum and the public’s generosity. To date the investment on the £5+m has been given to deserving charities in Cornwall of well over £7m and it continues to be Cornwall’s leading charity in this sector. Last year the Trustees supported 14 projects to the value of £164,000.In 2001 a small influx of Choughs came from overseas to settle in Cornwall. Today, thanks to preservation projects and the re-introduction of natural habitat by The National Trust and others, 46 youngsters have today been raised on Cornwall’s cliffs. 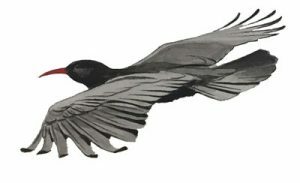 Now we are proud that two ‘birds of a feather’ thrive within Cornwall & the Isles of Scilly This history has been compiled by the late Ian Hamilton, John Cooper and Tim Guy, November 2016 Tim Guy’s original sponsorship campaign and alternative ‘Chough symbols’ offered by Dr Coombes for the identity.